Tech giant Apple brought iMessage Screen effects additive in its massive software update iOS 10 in September 2016. Its software update always moves time to time, like added Portrait Mode for iPhone 7 Plus users in iOS 10.1. Now, in December 2016 Apple rolling out iOS 10.2 and adds two new Screen effect for iMessage called ‘’Love with heart’’ and ‘’Celebration’’. Hence, iPhone users have total of seven full-screen effects (balloons, confetti, love, lasers, fireworks, shooting star and celebrations) to send in the iMessage. 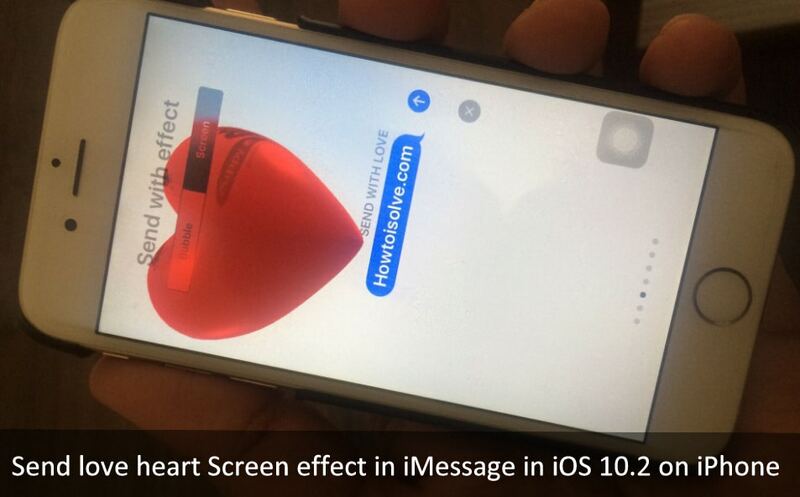 Let’s see how to Send love heart Screen effect iMessage in iOS 10.2 on iPhone. To use newly available iMessage Screen effects, you will have to download and install iOS 10.2 or later on your own iPhone. In addition, recipient must have iOS 10.2 on its own iPhone to display romantic with love/heart screen effect. 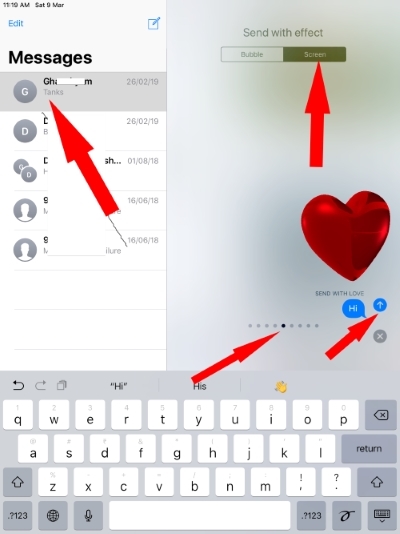 How do I Send love heart Screen effect iMessage in iOS 10.2 to iOS 12 or later on iPhone? Step 1. Launch Message App from your iPhone Home screen. Step 2. Open a contact or group to send Message with Screen effects. Step 3. 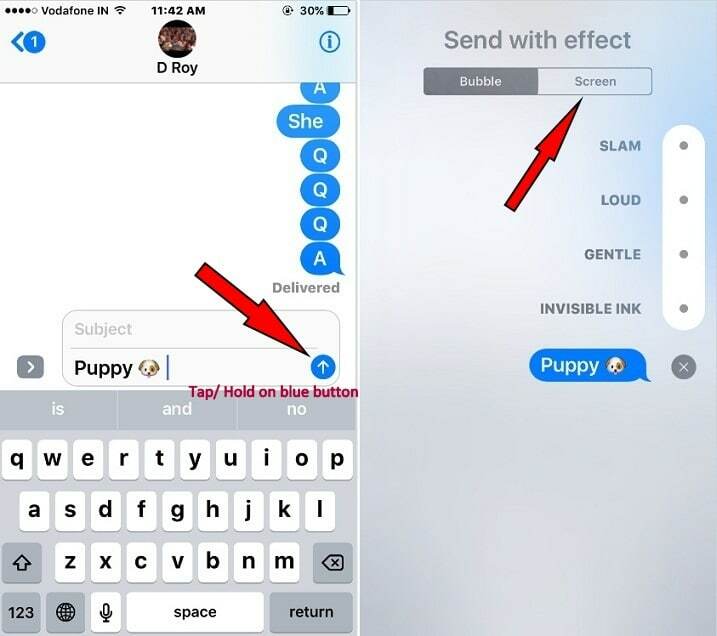 Now type your message in the iMessage text field then 3D touch (or tap/hold iPhone 6 plus or older iPhones) on the blue arrow/ send button until the Send with effect screen pops up. Step 4. Tap on the Screen tab at the top of the display. Step 5. 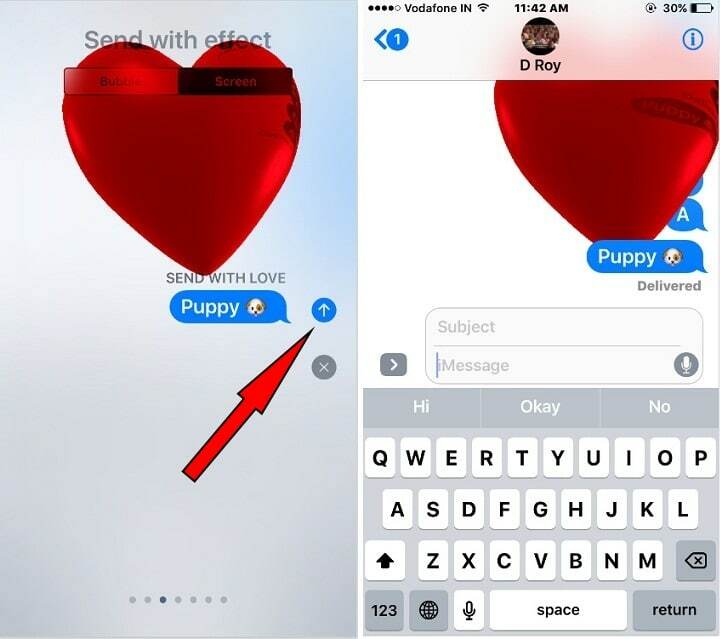 First screen is balloon effect, now swipe left until you appear love/heart screen effect to attach with text message. then Tap on blue arrow/send button. This new Love/ heart full-screen effect is the third effect on the iMessage screen effects display. Hence, you will have to swipe left side twice. using the same steps given above you could send celebration screen effects. This beautiful love effect is awesome for lovers, husband-wife. Lucrative celebration screen effect is good for upcoming festive seasons like Christmas 2016, New Year 2017 and future celebration festivals. Kindly keep in touch with us to get daily more features of iOS 10.2 in deep iOS 10.2 adds Emergency SOS on iPhone is also a most important one. Let’s Send love heart Screen effect iMessage in iOS 10.2 and get enjoy. Liked it shares on Facebook, Twitter. If you feeling iMessage screen effects not working after update iOS 10.2 on iPhone let me know in the comment box. We will try to give you best solution as soon as possible.